Looking for some quick and fresh recipes to make this summer? 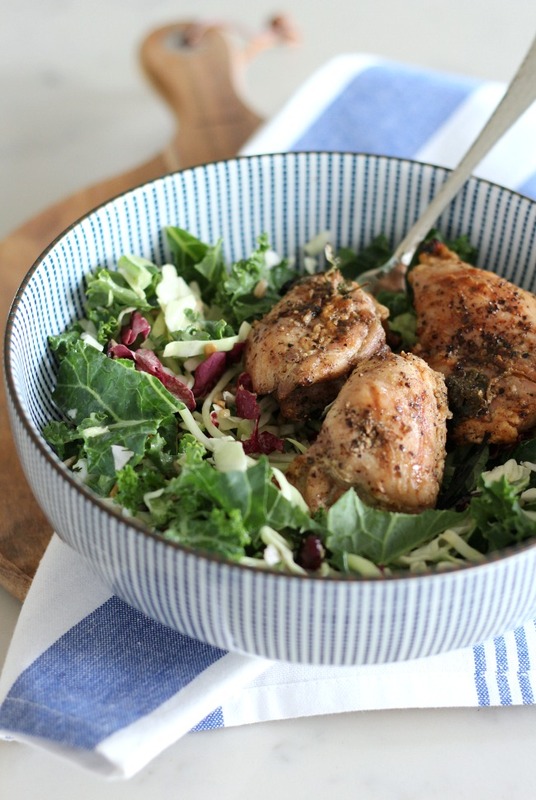 Try these delicious healthy salad options with herb infused grilled chicken. So delicious! This healthy meal ideas post was sponsored by Eat Smart as part of an Influencer Activation for Influence Central. All opinions expressed in this post are my own, as always. How’s June treating you? I’m smitten so far! Last month was an eventful one to say the least with our son moving home for his summer break from university, our niece’s graduation, as well as taking on all kinds of indoor and outdoor home projects. Thankfully, everything has settled down a bit, and I feel like there’s a better balance in our household. Phew! When we’re all going in different directions with our chaotic work and activity schedules, getting everyone in the family fed can be very challenging. For us, eating healthy is a priority, but making everything from scratch for every meal of the day isn’t very practical. I’m not sure it is for any family. Am I right? During those busy times, when the fridge and pantry start looking rather bare, and feeling frazzled is a daily occurrence, we’re more inclined to make bad food choices. Sometimes, we end up doing the takeout thing and, other times, we end up reaching for some sort of convenience food with very little consideration for nutrition. 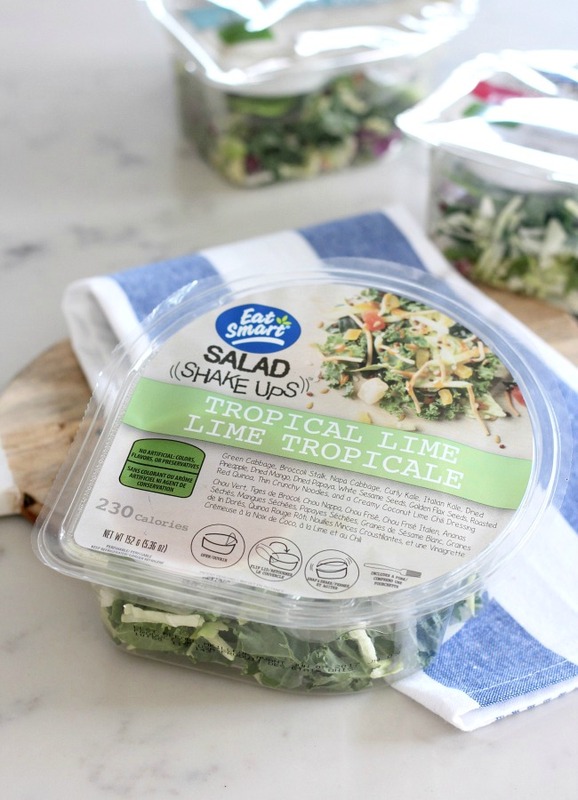 Recently, however, we’ve been introduced to healthy salad options from Eat Smart, making mealtime quick and easy, while still being delicious, wholesome and satisfying. Thank goodness! Life as a blogger usually means running around picking up DIY supplies, shopping for home decor, stopping at the thrift store or doing other errands several times a week. Instead of eating out, I prefer taking my lunch with me. 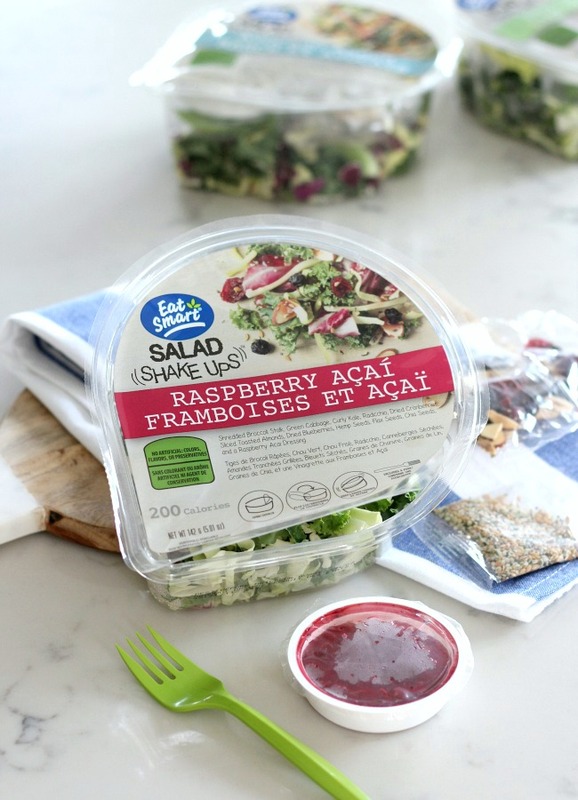 I love the convenience of Eat Smart’s new Salad Shake Ups, which are filled with everything you need to create chef-inspired flavourful salads, without any artificial colors, flavors or preservatives. See that label? It’s something I can get behind. I simply throw one in my lunch bag along with an ice pack, and I’m ready to go. It even has a convenient extra deep sturdy bowl for mixing, as well as a fork. When I get home, the packaging gets rinsed and thrown in the recycling bin, making it all very easy! My favorite in the bunch is the Raspberry Acai flavor, which is filled with all kinds of superfoods, including green vegetables, dried fruit, hemp, flax, chia and more. I honestly cannot believe the whole thing is only 200 calories, especially with the vinaigrette tasting so darn good. Options like these definitely help me stick to my personal wellness goals without much thought or effort. If you enjoy a bit of spice like my son does, the Tropical Lime salad with a creamy coconut chili lime dressing is one to try. He reaches for anything easy when it comes to packing his work lunch, so these are a lifesaver. Add some leftover chicken or steak, and he’s good to go until dinner time. More of a creamy dressing person? Try the Avocado Ranch with its yummy crispy toppings. This one has cheese, too, which is something I can never get enough of. Looking for quick and healthy dinner options? 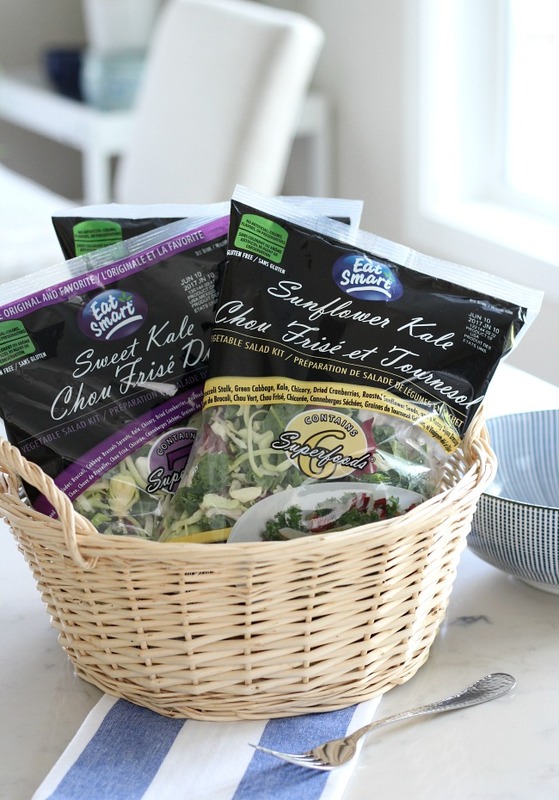 Eat Smart makes family-sized gourmet salad kits as well, including Strawberry Harvest, Sweet Kale and Sunflower Kale. We like to throw chicken or shrimp skewers on the grill to eat alongside one of these selections. 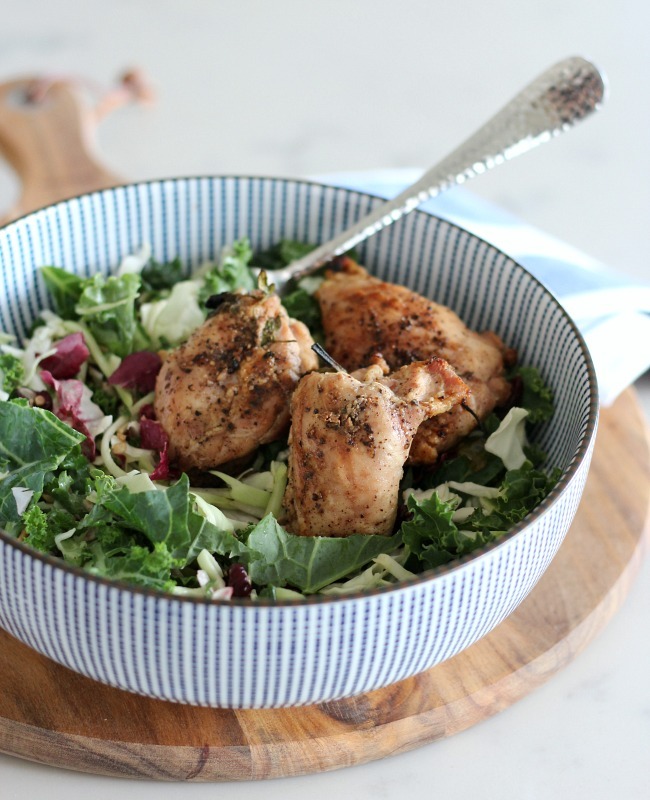 Last week, we had herb-infused chicken with the Sunflower Kale salad. 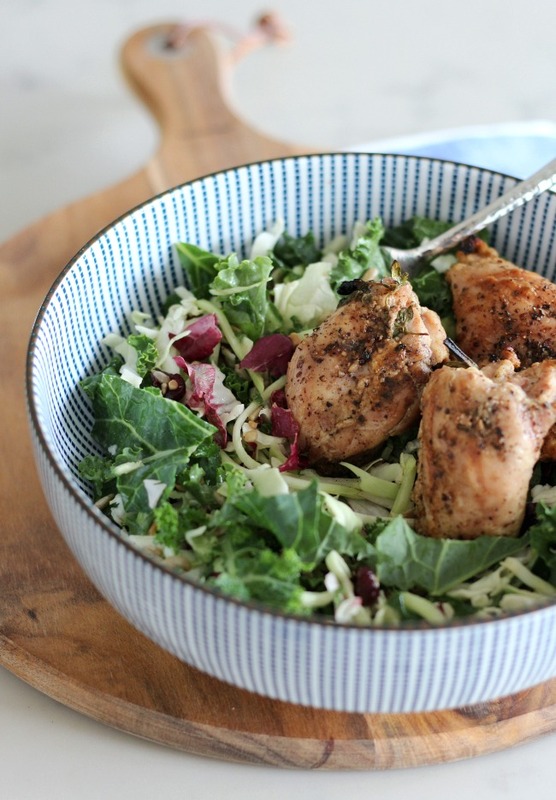 The honey dijon dressing paired deliciously with the chicken. So quick, fresh and yummy! In the morning, pour a simple marinade over boneless skinless chicken thighs (or breasts). If you forget, it’s okay to do it 30 minutes before you put it on the grill. Of course, longer results in tastier chicken. 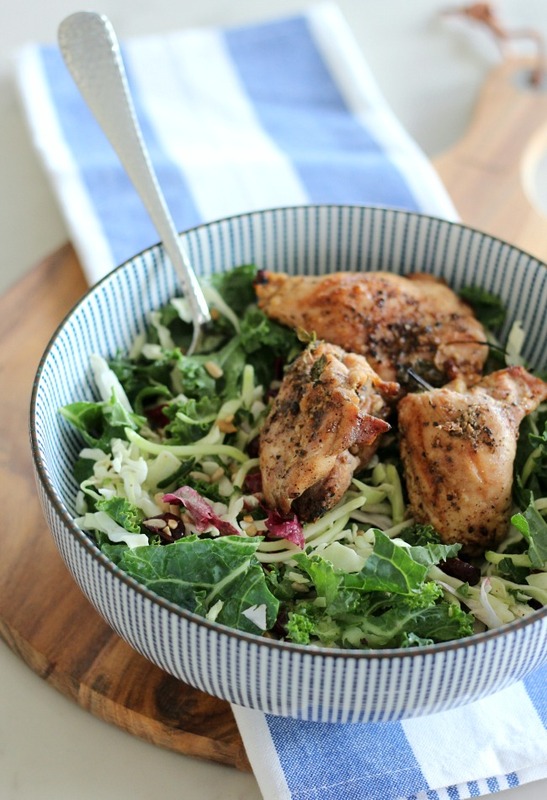 Finish off your fresh salad with this flavorful grilled chicken! Place chicken in a plastic sealable bag. Add olive oil, garlic, and herbs to bag, seal and use your fingers to gently work flavors into the chicken. Place on a plate in refrigerator for up to 24 hours. Preheat grill to 350-375 º F. Remove chicken from refrigerator and season with salt and pepper on both sides. Cook chicken (place herbs and garlic on top) at medium heat until outside is brown on both sides and internal temperature reaches 165 º F. Let rest 5-10 minutes before serving. Juices should run clear when you cut into the chicken. Always wash your hands thoroughly with soap and warm water when handling chicken. As well, clean your tongs before removing chicken from the grill and place on a clean plate. What can you expect from Eat Smart moving forward? By the end of next year, all products will be free from high fructose corn syrup, artificial preservatives, hydrogenated fats, as well as artificial colors, flavors and sweeteners (and will be labeled as such). In fact, 90% of their products are there already, including the varieties I tried. Eat Smart’s easy-to-understand labels will only contain recognizable clean ingredients that you feel good about feeding your family. I subscribed to their newsletter to receive exclusive offers, and you can too. Go to the Eat Smart website and scroll to the bottom left hand side of the page. 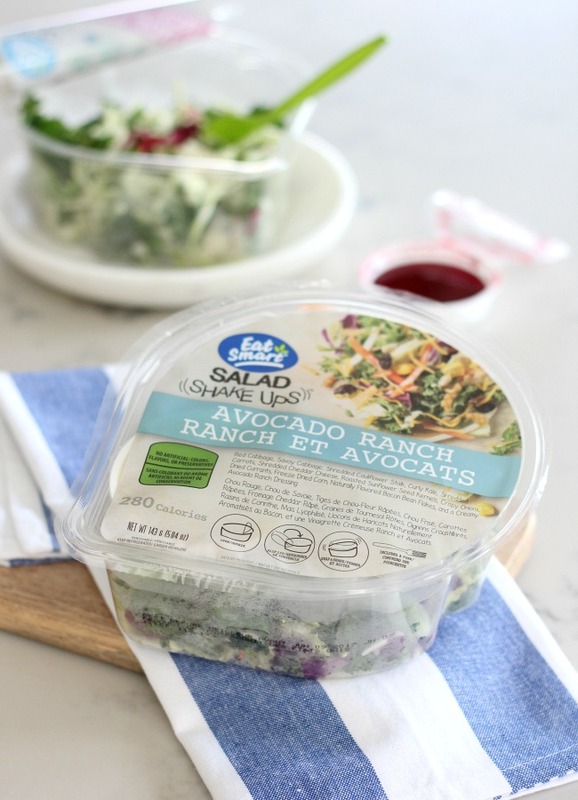 I’m thrilled to have these convenient and healthy salad options for our busy lives. It’s nice to be able to skip the stress of meal planning once in awhile, isn’t it? Have any half-made-homemade recipes of your own that are healthy? I’d love to add a few more to my summer repertoire. I need these. I would eat them for lunch regularly!